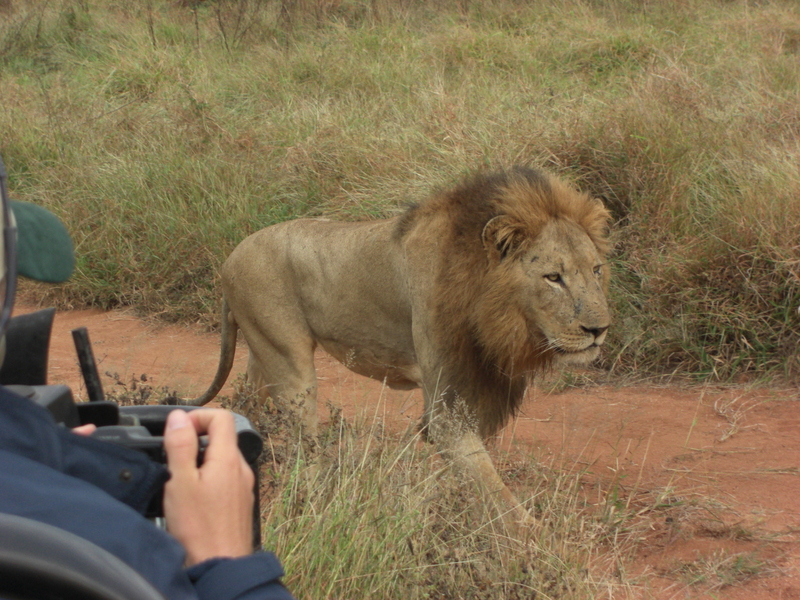 So we slammed a cup of coffee, grabbed a danish, and, as soon as our safari mates arrived, jumped in the Land Rover to set off for the lions. By 6:30 Gary had spotted one. 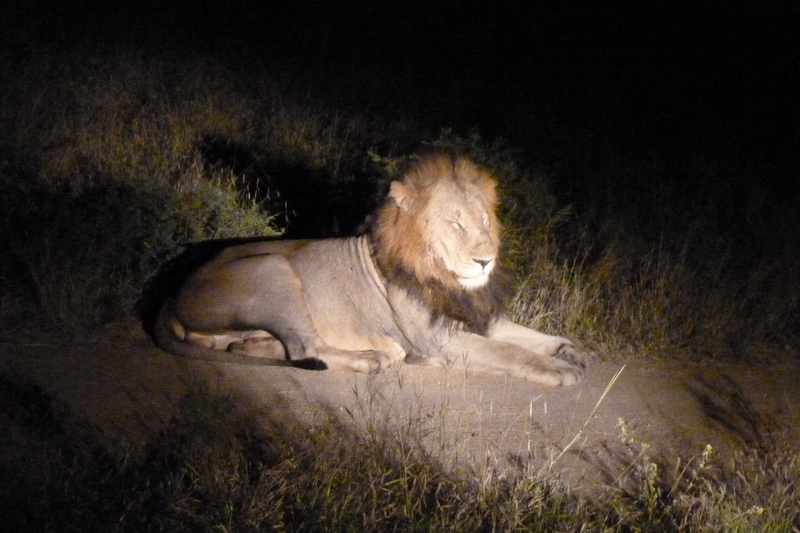 He was sitting on the tarmac of the MalaMala airstrip (far too expensive for us to have used instead of driving, by the way), probably because it was a warm spot. 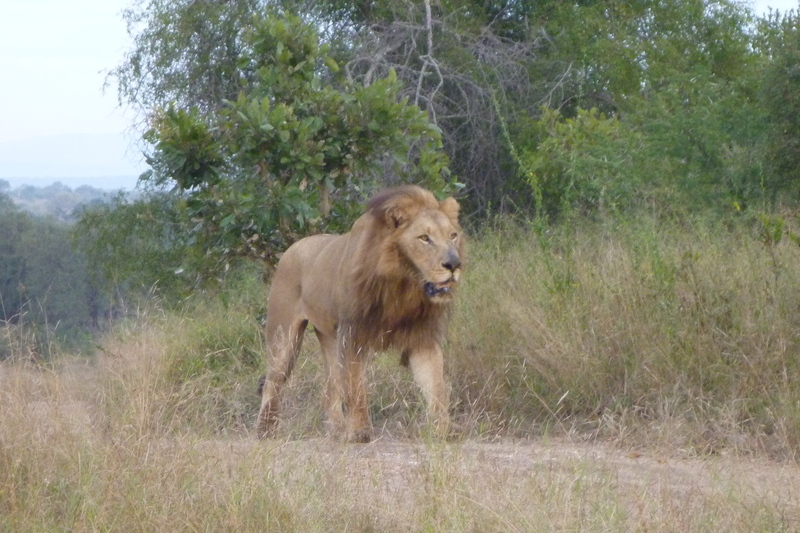 Soon he got up and walked into the bush, presumably in the direction of his brothers. We followed him for the next hour. 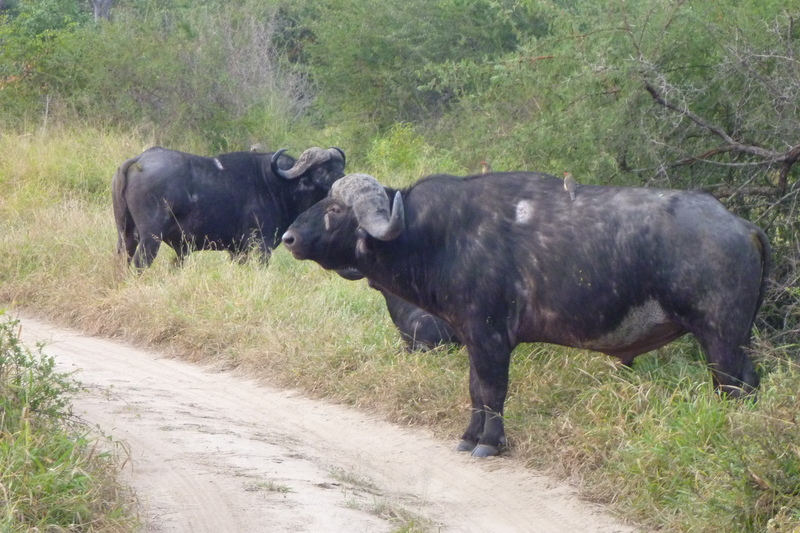 En route, we spotted the last of our Big Five—buffalo! 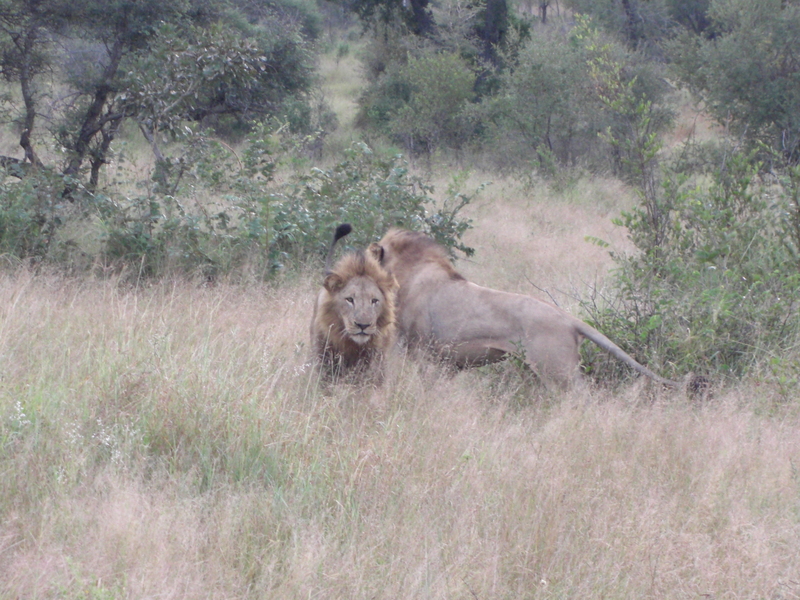 At 7:30 our lion met up with one of his brothers. Once they had each other in sight, they sped up their pace. They met with a big cat embrace, rubbing their manes along each other’s body. Seven minutes later, brother #3 arrived. There were four MalaMala vehicles present to witness the reunion, making a cacophony of camera shutters. 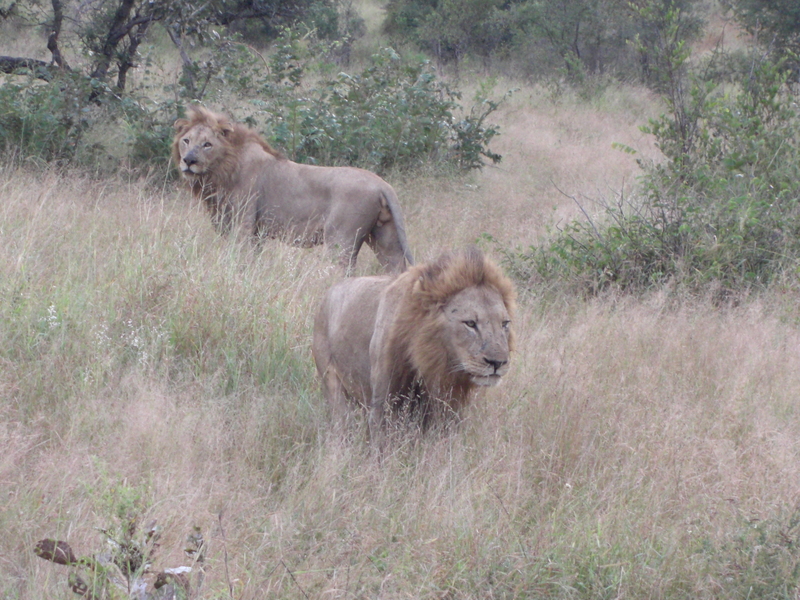 The lions didn’t seem to mind. 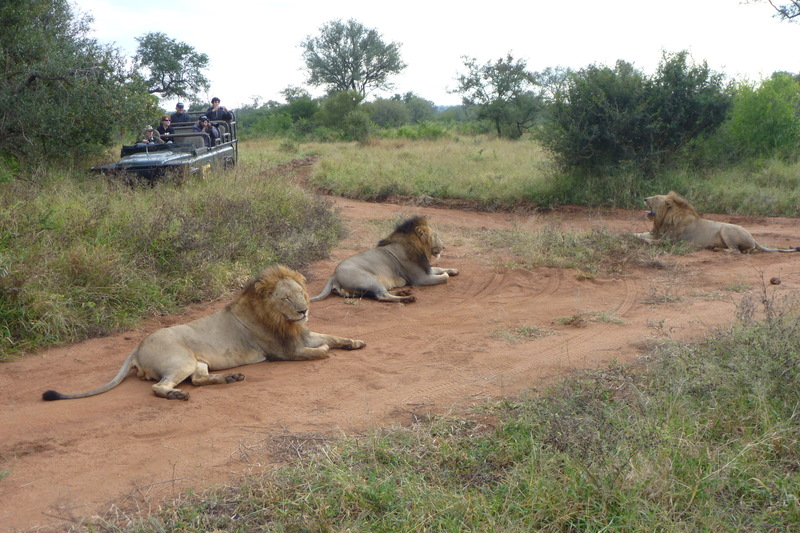 Some vehicles had been tracking different lions, and we all converged in the same spot. I loved how the rangers were constantly in contact with each other, and seemed to know everything that went on within their territory. 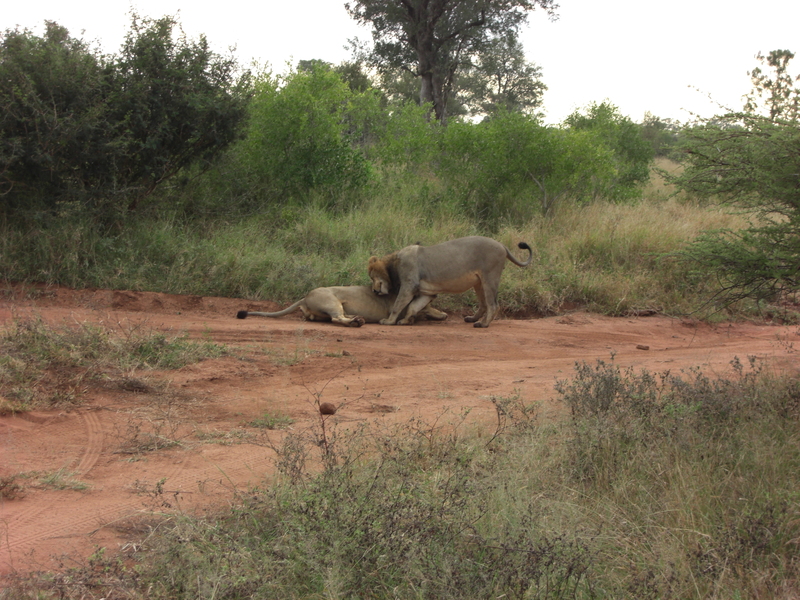 We spent quite a bit of time with the lions, watching them basically just lay there. But it was incredible nonetheless. Every time one so much as moved, you could hear all the cameras snapping away. By 9:45 we were back in the lodge for a later-than-usual breakfast due to the major event. I had the now-usual South African power breakfast of mixed tropical fruits, yogurt and granola. We could see an elephant playing in the reeds of the Sand River below us as we ate. 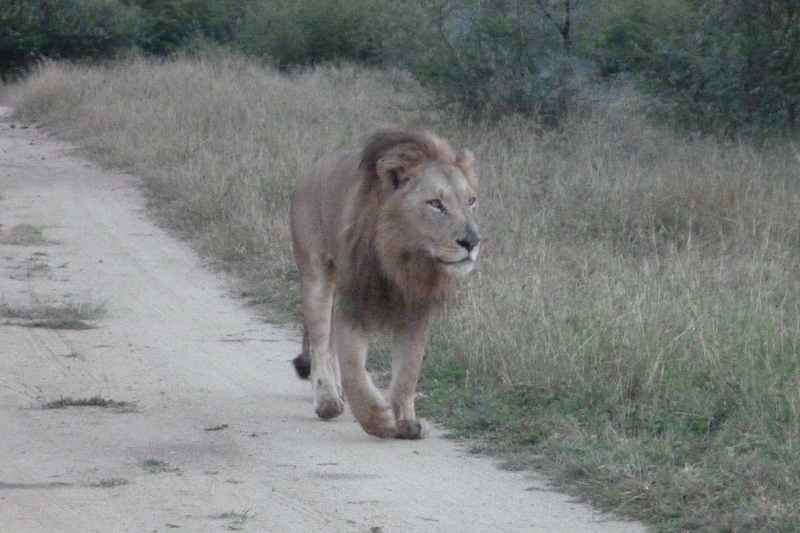 After breakfast we decided to join a foolish-sounding “walking safari.” Really, a safari on foot?? I don’t think I would have gone if I hadn’t already built up a lot of faith in our ranger guides. Besides, they go with guns. By then we had noticed that every ranger was armed. The guns were there for the protection of the guests, of course, in case something went really wrong while out in the bush. (Or even back at the lodge; Gary escorted us to our rondawel every night, and we were told to stay inside until morning.) Gary told us that the guns were cleaned, checked, and loaded every morning. Also that he’d never had to use his, nor does he know of anybody else who’d had to. Then he told us a story about the one time he came very close. 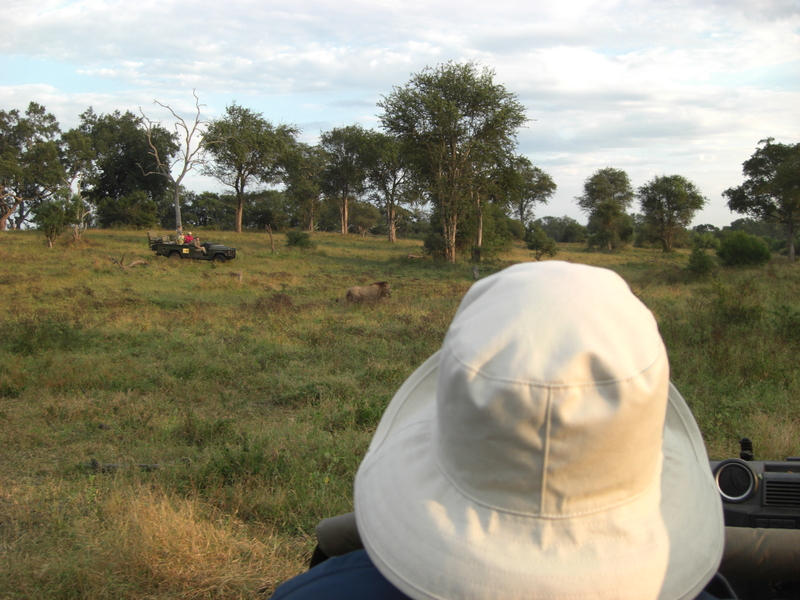 He was out on a drive with four guests, watching an elephant. He didn’t realize there was another hiding in the bush. When Gary moved closer, the elephant suddenly came out of hiding, charging the vehicle and blocking Gary’s only route of escape. There was nowhere he could go. He said he knew by the elephant’s behavior this was not a mock charge. He stood, gun ready, just about to fire, when the elephant backed off. He said he’d never been more scared, nor more relieved. 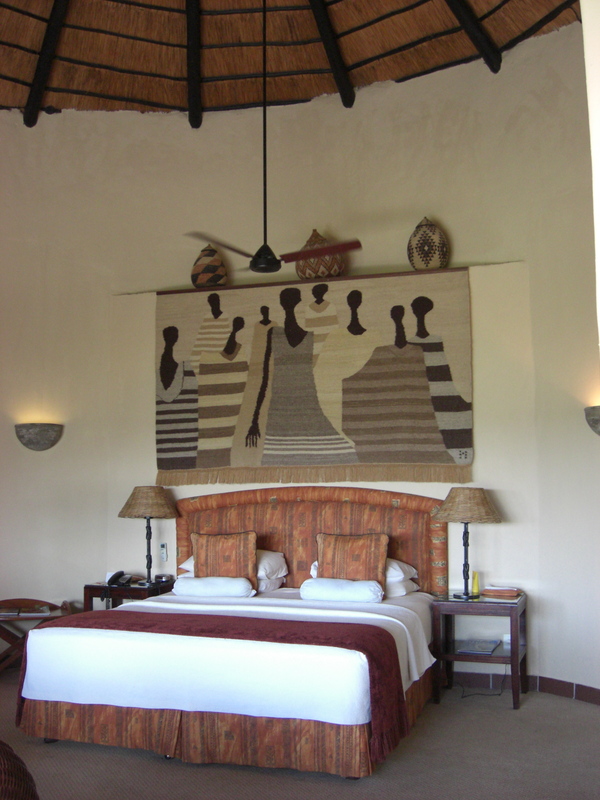 But managed to hide how much he was shaking from his guests until they got back to the lodge and he could recover alone. We told him about meeting up with the elephant on our drive to the lodge, hoping that the stories of elephants flipping cars were merely exaggerated urban legends. He said it’s not just a story, it really happens. Also that it doesn’t happen just to cars, but Land Rovers too. But, it’s not exactly random. You have to really make an elephant mad to get charged, and it tends to be only the males in musth that you have to worry about. A trained eye can also tell the difference between a mock charge and a real one. 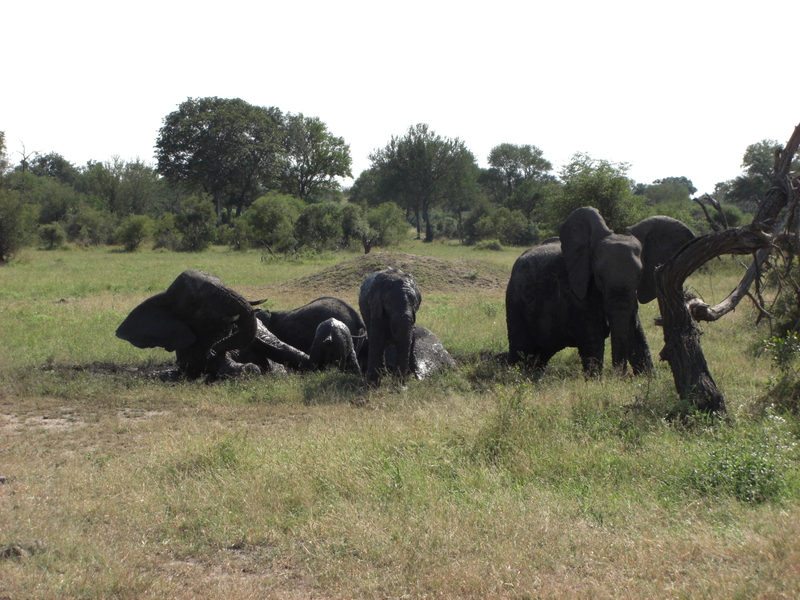 So, feeling slightly better about things, we drove to an open spot the rangers preferred for walking, past some elephants bathing in a mud pit, and then climbed apprehensively out of the vehicles. We walked for a little less than an hour, mostly talking about traditional uses of the shrubs and trees around us, spotting some birds and reptiles. The rangers told us quite a bit of information about each sighting, but I must admit to having remembered none of it. 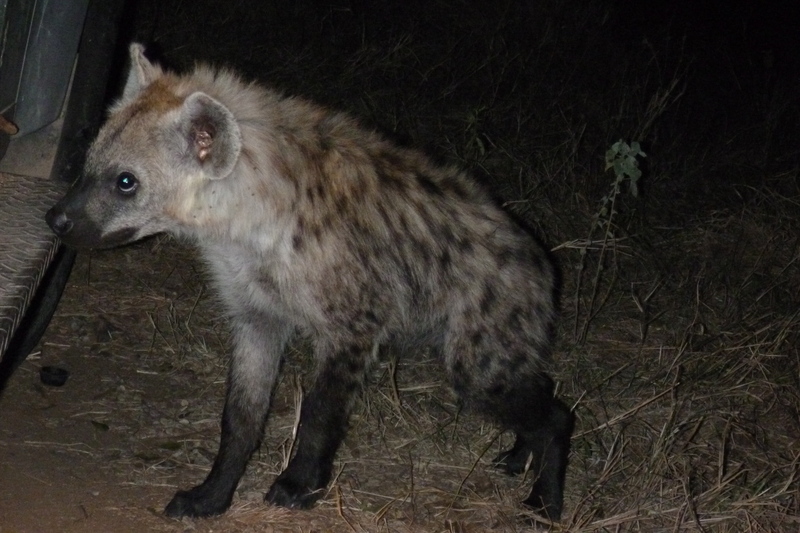 I don’t think I paid very close attention, busy instead scanning the horizon for cat-shaped stalking objects and inventing news headlines in my head about a walking party mauled or trampled to death on 16-May-2011. Walking tour gratefully over, we climbed back into the vehicles and headed back to the lodge. 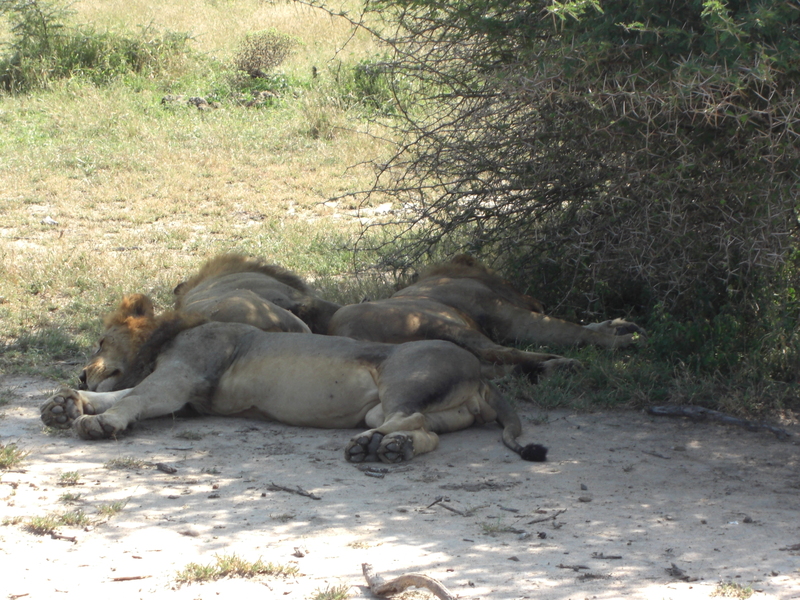 A few minutes down the road we spotted all three lions, snoozing under a tree. Did the rangers know they were there and not closer to us while on foot? Surely. 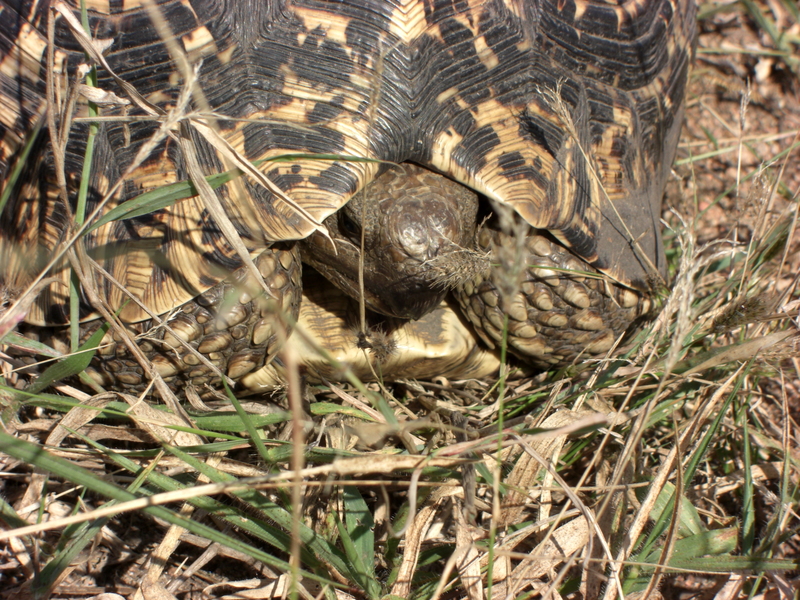 One of them lifted his head as we pulled around, blinked at us a few times, then drifted back off to sleep. 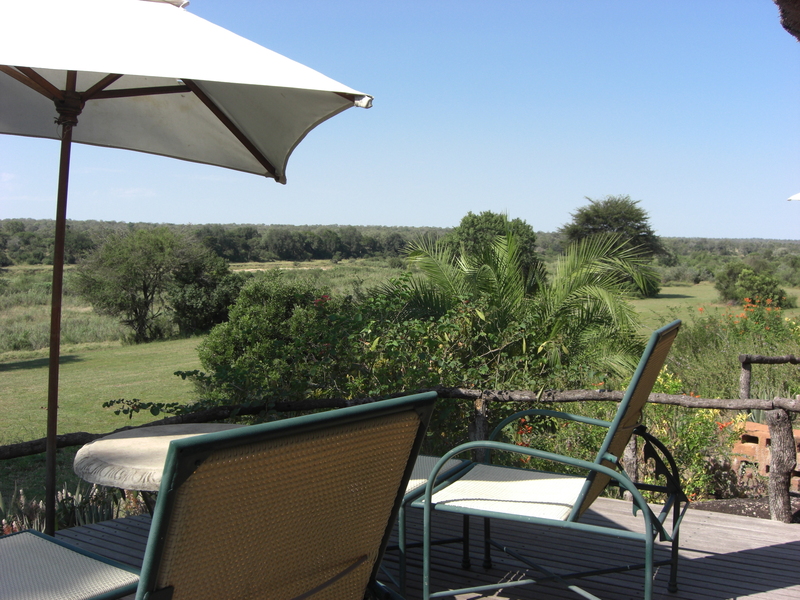 We had lunch back at the lodge, then a little free time in the heat of the afternoon, when animals are the most inactive. We got to look around our digs for the first time since we’d arrived, and discovered the most amazing thing—an outdoor shower! There were indoor showers, too, but the outdoor one was such an incredible feeling with the afternoon sun shining in on you, and the occasional lizard popping his head over the wall. It was so peaceful. We decided right then and there that if we ever get to design and build our own house, it will have an outdoor shower. Around 2pm was afternoon tea and snacks. And this after first breakfast, second breakfast, and lunch. Coming up we still had sundowners and snacks, cocktail hour, then dinner. Turns out that’s the only trouble with a safari. You spend a huge amount of time sitting on your behind being driven around and eating 7 times a day. Not exactly an active kind of vacation. 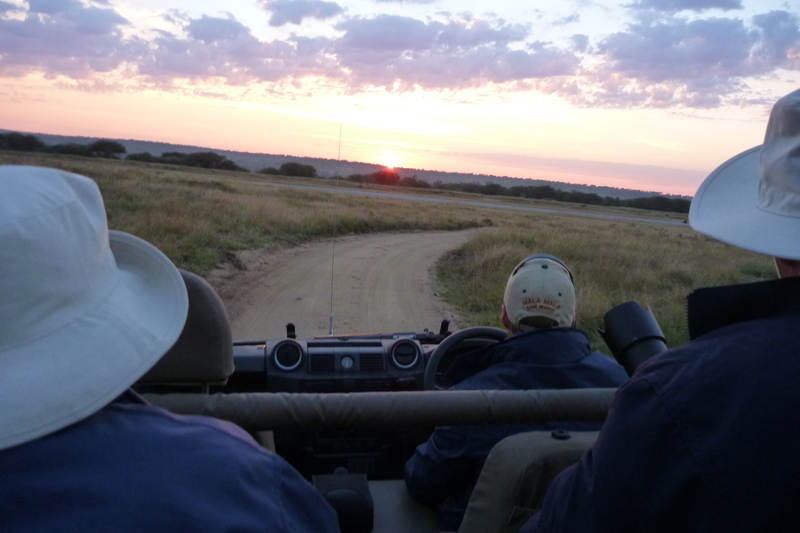 After the sun set, Gary asked us if we’d like to take a long trip across the reserve to go check out a hyena den he knew of. Having had our fill of lions and leopards for awhile, we said sure. It was a long detour, but well worth it. We had the place to ourselves, not coming across another single vehicle the whole evening. 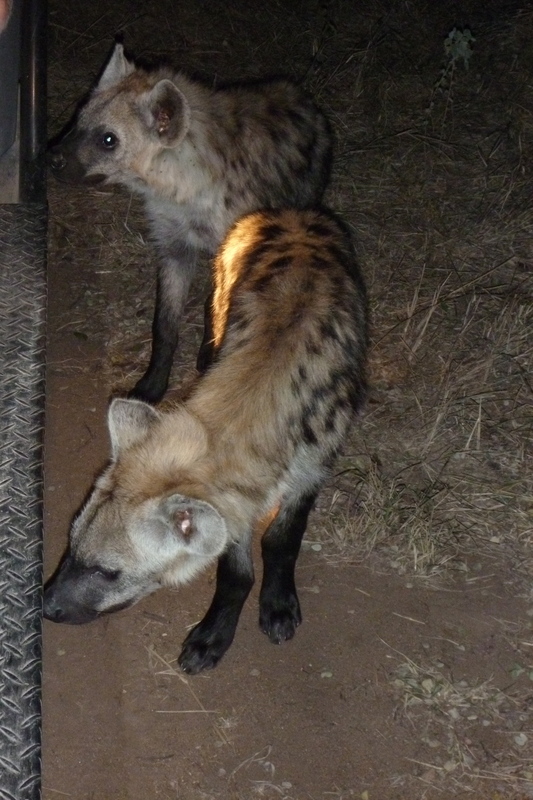 The adult hyenas were out hunting, leaving their youngsters home alone. 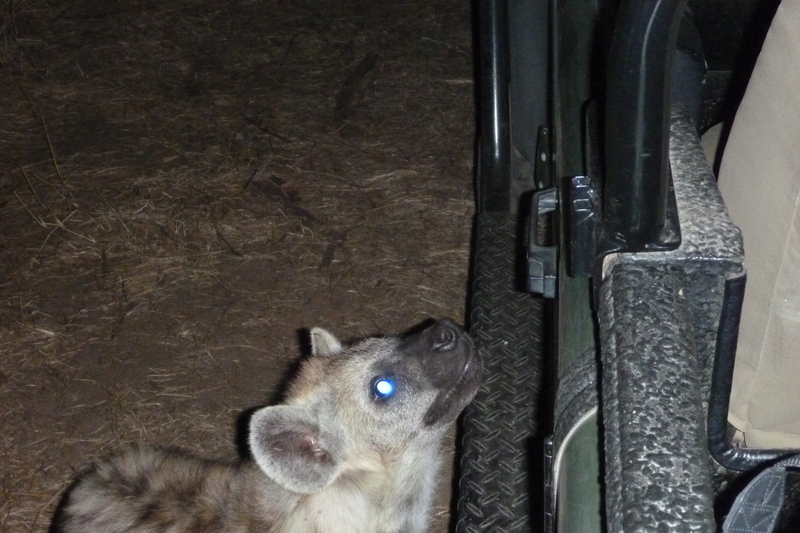 The little guys were cute—as long as we overlooked the fact that hyenas can easily rip your face off. Around 8pm we started heading home. Oh! 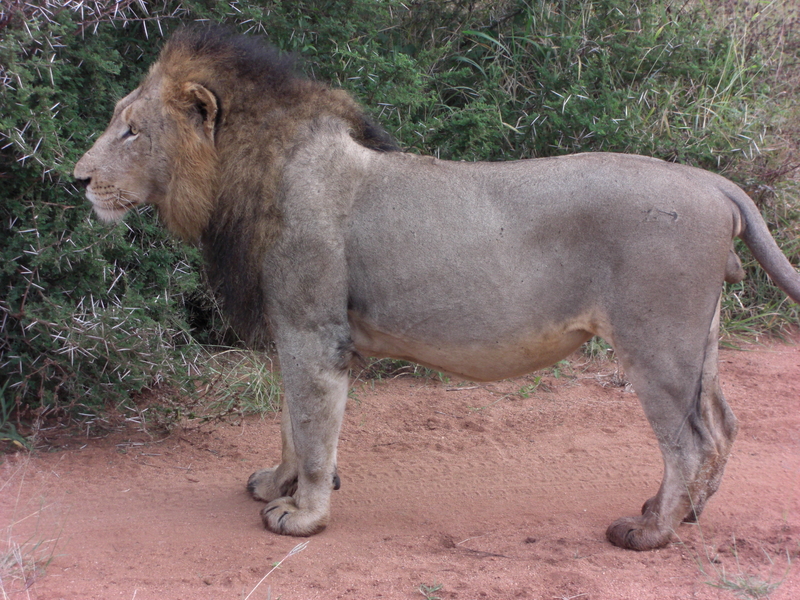 Another lion. hey, do you mind with the light? 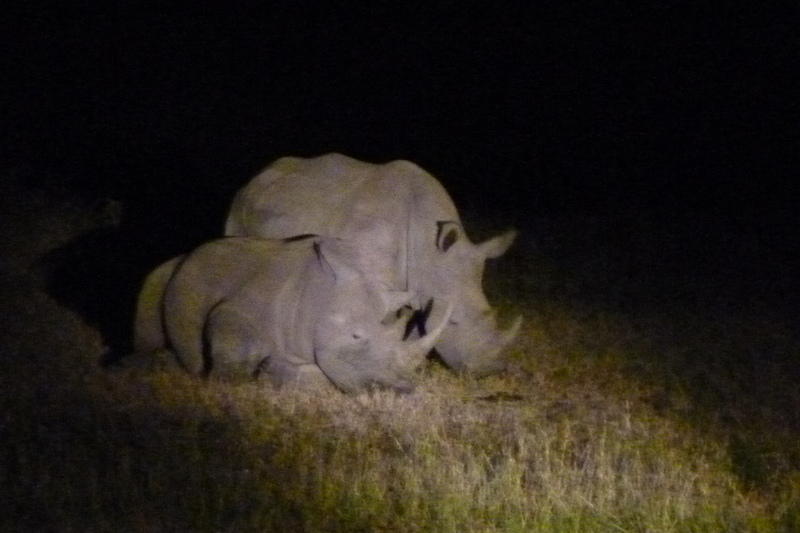 The Kruger area has been and still is fighting a major battle against rhino poaching. They lose hundreds of rhinos every year to poachers, interested in the horn because it’s considered a crucial part of traditional Chinese medicine. The poachers have become very sophisticated, and very dangerous. The population of black rhino has declined by over 90% in the last 60 years or so. I’m having trouble verifying this information online (and lately I’ve been running out of my monthly internet allotment before the end of every month, so I’m trying to be careful), but I recall Gary telling us that South Africa had just passed a “shoot-to-kill” law to try to combat poaching. In other words, rangers have the right to kill poachers on sight. 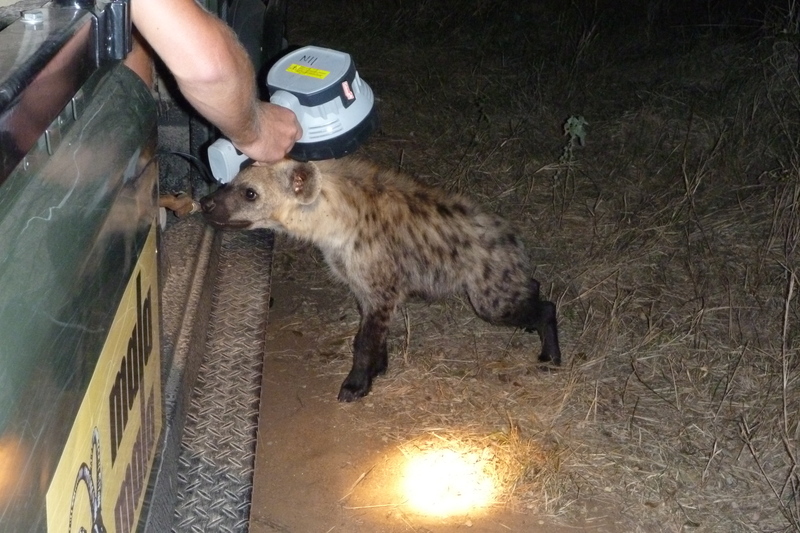 And at first it made a very positive impact on keeping the poachers away. They’re discussing other tactics, such as legalizing the trade in rhino horn, or proactively de-horning them, thus keeping them alive. Other parks do exactly that, and have found frustratingly that poachers continue to kill the hornless rhinos, perhaps as retaliation. If you’re interested in more information, or how to get involved, visit savetherhino.org. Anyway. 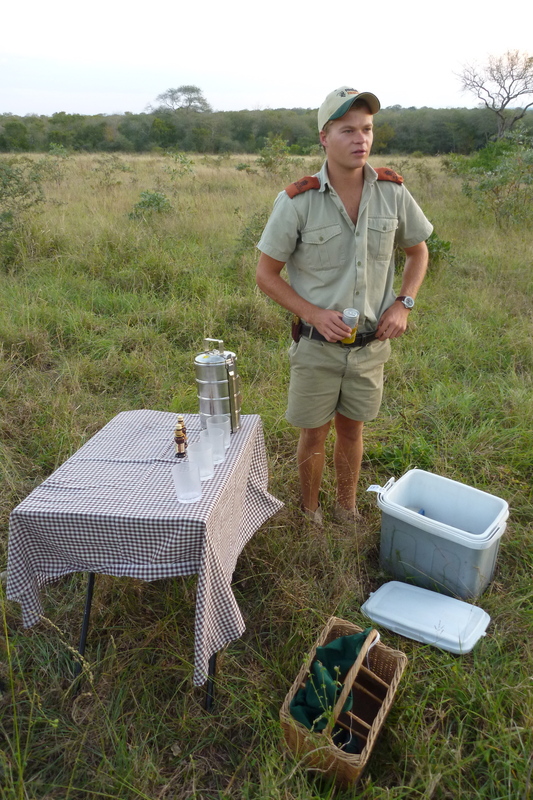 Back at the lodge, we hung out at the bar with more drinks and more snacks, reviewing the day’s sightings with Gary and chatting with other guests and rangers. We were tired, but pumped up on adrenaline. Gary kept a close eye on us the whole time, I think both for safety reasons as well as being a good host. He ate with us, drank with us, even walked us to and from our rondawel. We felt well cared for. 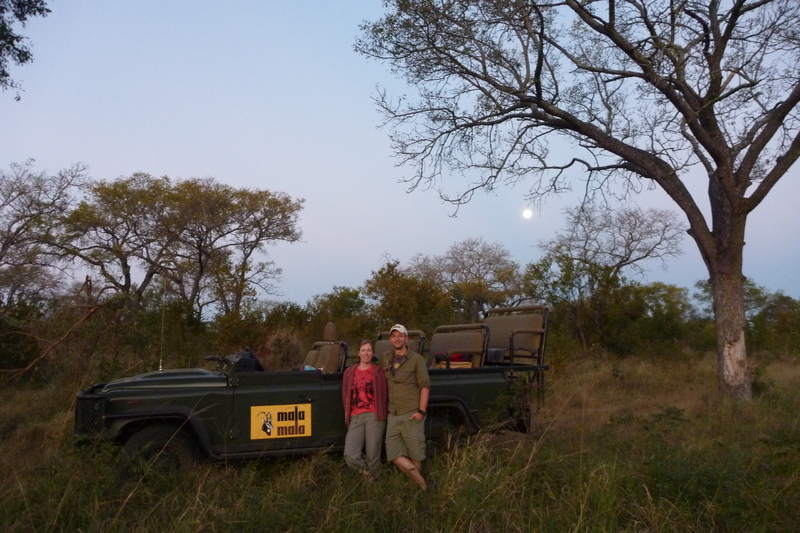 It’s hard to imagine any other safari coming anywhere close to this amazing experience. Great story … wonderful pics … sad about the African rhino and shame on the poachers … am sharing story/pics with your cousins Todd, Anna & Ashley! Another great story. We recently watched a news program that discussed how the ivory trade has caused the elephant population to decline drastically in South Africa. They showed how park rangers are now capturing elephants and trimming off their tusks (like we cut our fingernails) to make the elephants less apt to be killed by poachers. I’m sure the elephants aren’t too happy after awaking from their tranquilizer to find their tusks much shorter, but hopefully, they’ll be alive for many years to come.